In conjunction with The Climbing Works and The BMC, we run InsideOut bouldering outdoor bouldering courses throughout the year. 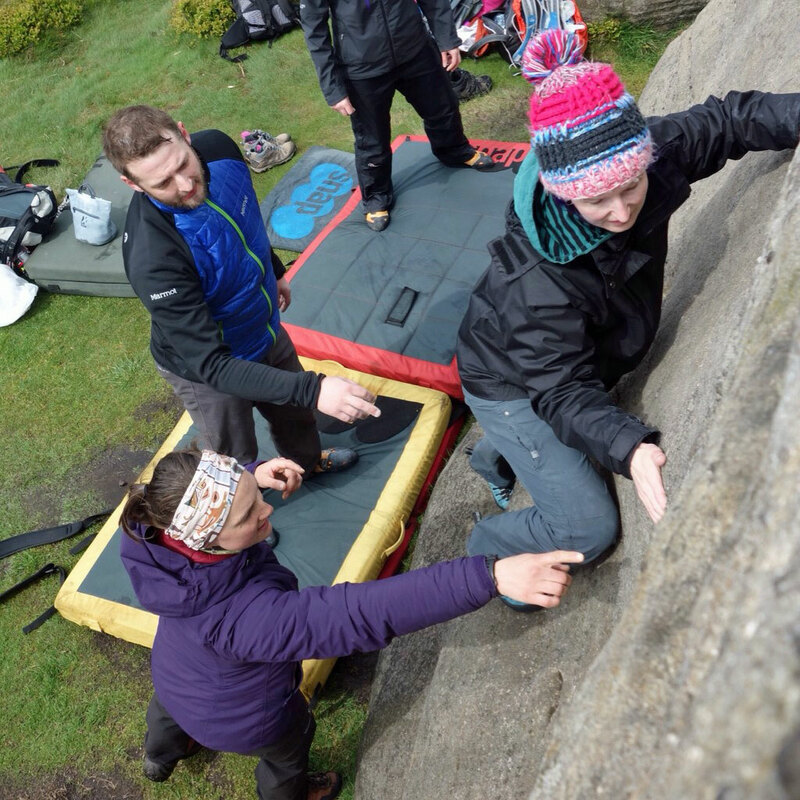 The first course for anyone new to outdoor bouldering is the InsideOut Introduction which takes place at Burbage South, just 20 minutes drive from us and The Climbing Works. Participants will get to ‘grips’ with Peak Gritstone, learn safety and environmental management, the Do’s and Don’t’s of outdoor climbing and of course put into practice all the skills and techniques learned inside, outside. Once participants have completed the introduction they can then attend any of the Developing Skills Courses. These will take place at different venues in The Peak District, including the famous Stanage. All the new skills learned on the intro course will be put into practice giving participants the confidence and knowledge to access bouldering in the Peak District. For further information, costs, course dates and booking details please visit The Climbing Works website. For one-off sessions please contact us to express interest. Do you want to make the move from climbing indoors to climbing outdoors? Do you want to learn to lead climb? Do you want coaching to improve your climbing? Do you just want to experience outdoor climbing in some amazing locations? Do you need a birthday present idea for your friend(s) and think they’d appreciate one of the above? Bespoke climbing and bouldering training is available for individuals and small groups – please contact us to discuss the different options. We are a British Cycling accredited centre and have great coaches, excellent facilities and a brilliant location for mountain biking. Onsite we have open spaces, a bike skills park and challenging trails in the woods that are used by a variety of groups, from 8 year olds learning to ride a bike to Olympic development squads. In easy riding distance, accessed by the traffic free Monsal Trail or quiet local roads, we have good trails and bridleways for mountain bike journeys. Our central Peak District location means that we’ve various classic mountain biking trails within driving distance. Onsite skills sessions – tailored to the groups needs and ranging from learning how to ride a bike to jumps and drops skill coaching. Journey skills training – following some initial onsite skill assessments and training go on a mountain bike ride & have a great time whilst being coaching in riding technique, navigation, bike repairs and more. Guided classic mountain bike rides – meeting at the centre or elsewhere in the Peak District our instructors can ensure that you have a great day out riding the best of what the area has to offer. Walk into the dales of the White Peak District from the centre or take a short drive to the extensive moors and gritstone edges of the Dark Peak District. If bigger mountains are calling then training can be arranged in Snowdonia, the Lake District or Scotland. If lowland walking is more your thing then training can be delivered around Sheffield, in the White Peak or elsewhere if more convenient to you. Navigation – from the very basics of map reading to micro navigation in the dark. Exciting and enthusing others about their surroundings on a walk – e.g. flora and fauna, local history etc. Relocating yourself when you get lost. 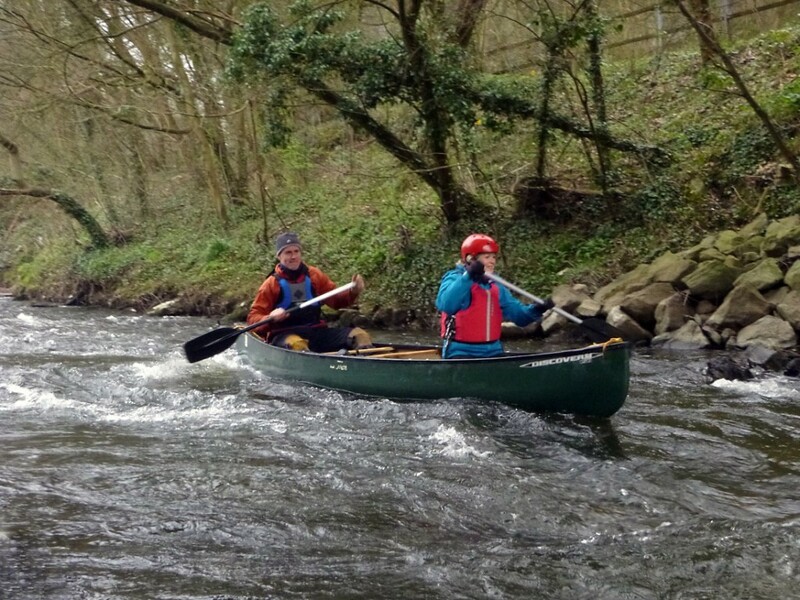 Canoeing skills training can be arranged for individuals, couples or small groups and will be designed to meet the specific needs of those involved. Courses may take on nearby lakes, canals or river. With both cave and mines, including horizontal and vertical systems, to explore in the area around Thornbridge Outdoors we are well placed to provide caving skills training. Caving skills training can be arranged for individuals, couples or small groups and will be designed to meet the specific needs of those involved. Navigation – both above (you need to find the cave..) and below ground. Vertical caving experiences and skills. First aid courses for schools as part of school INSET days, groups of D of E leaders and a course tailored for Pony Club leaders.